These teen superheroes have many powers, but charisma isn't one of them. Back in the 1970's, The Tomorrow People originally aired as a children's show in the UK and, like much sci-from that era, came complete with campy features like a biological talking computer named TIM and snazzy belt buckles that helped augment the characters' superpowers. In its update for a modern CW audience, the camp and the kids are gone, replaced with healthy doses of angsty daddy issues and government paranoia. High school student Stephen (Robbie Amell) has been dealing with some very odd issues lately. These problems include waking up in his neighbors' bed, despite having tied himself down before going to sleep. Despite many trips to different doctors and a regular habit of choking down doses of anti-psychotic pills, nothing seems to be getting better. Stephen has also been hearing the voice of a woman named Cara (Peyton List) in his head. When he follows her instructions one night, he's lead into a strange secret hiding spot where, in addition to Cara, he meets others like him. These folks call themselves "Tomorrow People," with Cara quick to point they did not come up with that designation. These folks are a step ahead in genetic evolution and have the ability to teleport, communicate telepathically and move objects telekinetically ("the three T's"). Stephen is the son of their former leader, who vanished without a trace several years ago. Cara, along with her co-horts John (Luke Mitchell) and Russell (Aaron Yoo), hope that Stephen will be able to use his powers to connect with his father and bring their mentor back to them. A secret government organization called Ultra is the enemy of the Tomorrow People. Led by evolutionary biologist Dr. Jedikiah Price (Mark Pelligrino), Ultra is committed to capturing all of these superior beings and using them and their powers to round up the rest. Price fears what the Tomorrow People are capable of and wants to be able to control them to protect human-kind. In translating The Tomorrow People to the here and now, creator Phil Klemmer may have removed the period goofiness (though robot TIM still remains, voiced by Downton Abbey's Dan Stevens), but with nothing added to help define it, the show just feels like a stale X-Men clone. While some of the teleport-enhanced fight scenes can be enjoyable, it's surprising how little fun this show is. There's no humor or sense of enjoyment in this world and it drags everything down. This isn't helped by the series being populated with a cast full of beautiful young characters who are total charisma voids. Despite the fact that Amell was bubbly and funny in last Spring's 1600 Penn and List held her own as Roger Sterling's young bride on Mad Men, they are both painfully dull here. Hints of a brewing love triangle between Stephen, Cara and John feel machined to fit the network's target demographics as the actors have no chemistry with each other. 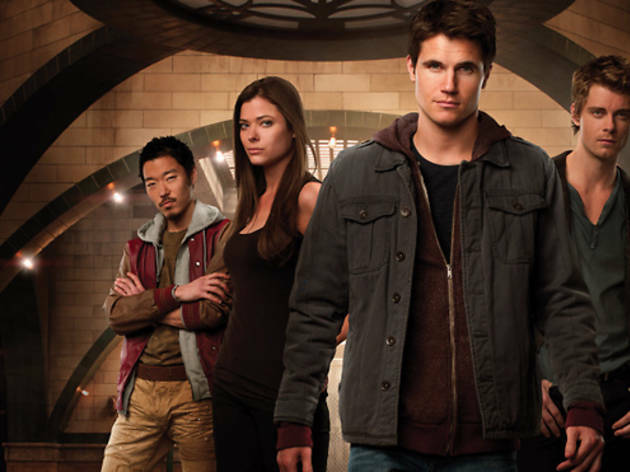 Like Cara's attempts to distance herself from the titular moniker, The Tomorrow People feels ashamed of its heritage. Rather than embrace its silliness, the show plunges into a dark, sticky pool of teen angst that weighs down what could have been a frothy and fun supernatural drama.